Danielle Stech-Homsy was born in the mountains of Northern New Mexico on a cold January morning. She was raised there and in coastal California by her mother, a seamstress, and her father, a painter and set-designer. In school she studied languages and poetry and later moved to New York City where she taught children and adults to read and write and began to share her own writing, and eventually her songs, with friends and audiences. Her first recordings of songs for voice and baritone ukulele were shared only with friends, but soon after, her first studio album "The Bride of Dynamite" was released on Devendra Banhart's Gnomonsong label in 2006. 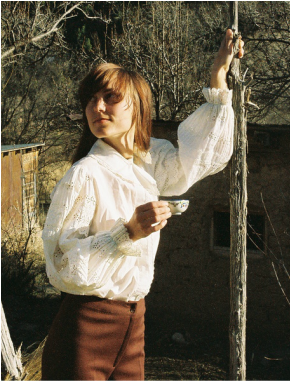 In 2008 she moved back to New Mexico and recorded a second album "Frontier" (Manimal Vinyl) featuring baritone ukulele, percussion and layered vintage synthesizers. Since 2005 Rio en Medio has toured in the US and abroad, often participating with other artists as guest or main support. She has performed as main support for several notable artists, including Vashti Bunyan, CocoRosie, Brightblack Morning Light, Devendra Banhart, White Magic, Grizzly Bear, Vetiver and Michael Hurley. She has also performed at ATP Festival in England. In 2008, Danielle's sophomore LP Frontier was released on L.A.'s Manimal Vinyl label. Called by Pitchfork "hypnotic and captivating", Frontier melds woody uke flourishes with brackish synths and organic dance beats in a landscape of sci-fi pop imaginings. Her 2013 release, PEACE SEQUENCE (Womens Work Recordings) is a slow-shimmering folk album that features guest performances by Japanese Koto player Shoko Hikage and psychedelic multi-instrumentalist Nathan Shineywater. In 2015, Danielle's fourth album, ﻿"RIO EN MEDIO RADIO"﻿ was released on the feminist exploratory label Women's Work Recordings. It brings together carefully interwoven narratives from poems, folk songs and other texts to paint a picture of time in flight. The fragmented authority is brought home by Danielle's strong, clear melodic and harmonic sense. Organic, spartan baritone ukulele, guitar, cosmic keyboards and harmonizing vocals form the backbone of the songs. Here and there a friend drops in to play along - Terry Cox, original member of the 1960's folk-baroque band Pentangle (&amp; contributing drummer for David Bowie, The Bee Gees) lends his nuanced approach on drums, while Dave Roe (Johnny Cash &amp; the Tennessee Three) chimes in merrily on bass to fill the speakers at just the right moments. Nathan Shineywater (Library of Sands, BrightBlack Morning Light) contributes lead guitar and percussion in highlighted places. Harmonica is played by George Flynn, a 90+ year-old war veteran &amp; former chauffeur for Hank Williams. More about the New Album!